What makes for a Michelin-level dining experience? For Michelin-starred Chef Jason Atherton, it is benchmarked by three standards: great food, quality ingredients, and a passionate chef. His culinary gem in Cebu, The Pig & Palm, upholds these three pillars for a gastronomic love affair at one of the Top 20 restaurants in the country. For Valentine’s Day, this modern European tapas-style restaurant whips up 2 delectable 5-course menus for you and your loved one. 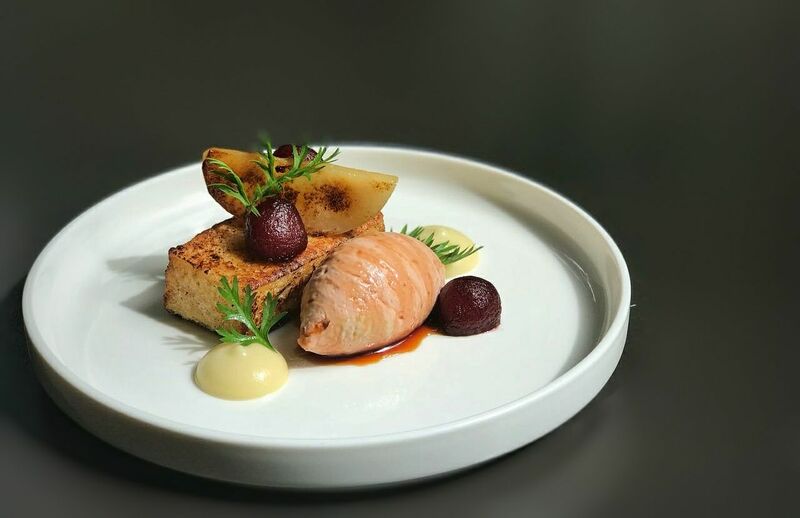 To start, tease your palates with a Foie Gras Parfait with apple and French toast. To follow, savor a Beetroot and Goat’s Cheese Risotto. For the main course, indulge in a serving of Beef Short Rib with fondant potato and braised king oyster. Head Chef Karl Emsen has also concocted a non-meat option with Tuna Tataki with cucumber, radish and ponzu for starters and Roasted Salmon with peas, ham and lobster bisque for the main dish. Both menus finish with a flourish with a decadent Strawberry, Rose, and White Chocolate Lollipop, and Blackberry Eton Mess. The Valentine’s set menus are available for dinner on February 14 and served with a round of Cava at P2,800 per person for the meat course and P2,300 for the fish course.